Pesto Bread is sensational. I’ve found a lot of great breadmaker recipes from my well-used Black and Decker breadmaker over the years and this one for Pesto Bread is one of them. It has the wonderful savory flavors of parsley, garlic, basil and parmesan cheese permeating every bite. Not only that–it is so EASY! You just layer the ingredients into the breadmaker and in a few hours you have the fragrant aroma of freshly baked bread wafting through your house. That heavenly smell is enough to do me in every time. I grew up in a household of bread lovers. 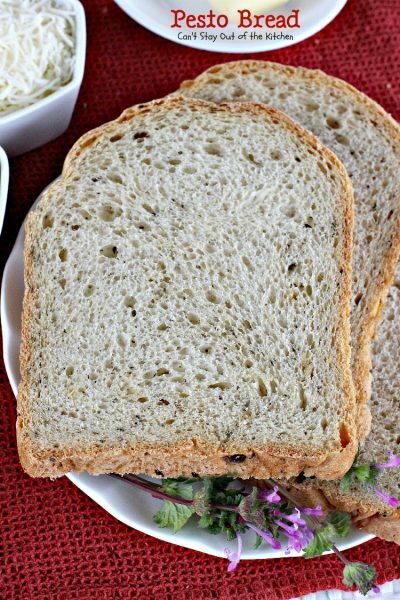 While my generation didn’t consider homemade bread a real treat because we ate it every day, it certainly was a treat coming home from school and smelling my mom’s homemade breads sitting on a rack to cool. Mom wouldn’t let us snitch a slice either. We would have to wait for our meal to have a slice or two so we wouldn’t spoil supper. Nowadays, home baked bread really is a treat because it is so rarely made. 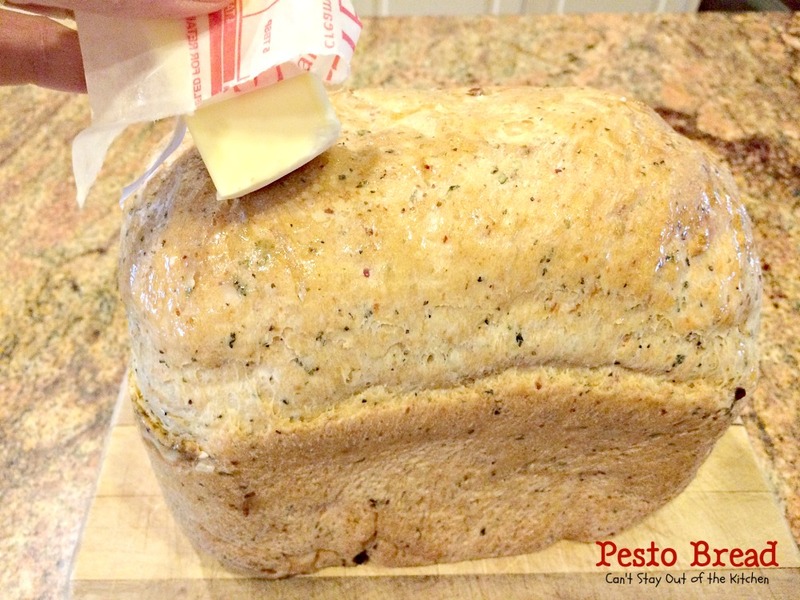 I made this delicious Pesto Bread to give away to a family last week but we have had this recipe many times. I usually end up using dried herbs but if you grow your own herbs that would make this bread even more special. 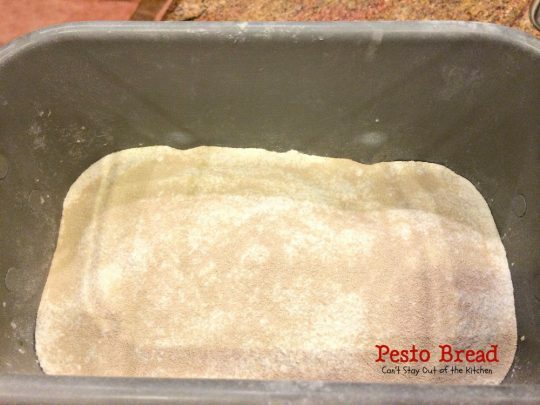 Using a high quality parmesan cheese also will improve the flavors tremendously. Pesto bread is a great dinner bread your whole family will enjoy. If you’re looking for a bread recipe for a 2-lb. 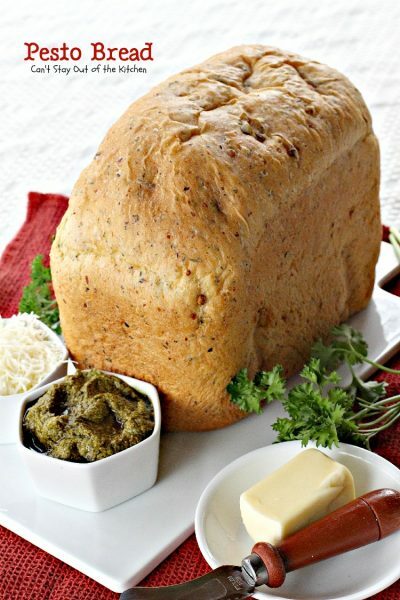 loaf for your bread maker consider making this easy and tasty recipe and treat your family to the smells and tastes of this wonderful comfort food. This recipe is great to serve with chili or Italian dishes, too. 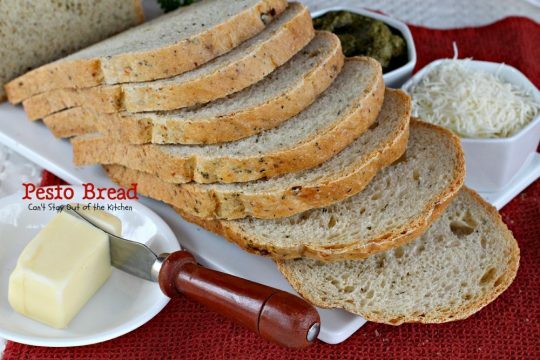 Spread lots of butter on thick slabs of bread and you’ll be in seventh heaven! Sprinkle with garlic salt, parsley, and some more parmesan cheese and toast in the oven and you will have an incredible feast! When I first posted up this recipe in February 2013, I only had a cheap iPhone 4 camera. My pictures weren’t clear, plus at that time I didn’t realize that food shows up better on white plates rather than colored plates. So, all in all, my pictures didn’t photograph very well. I recently remade this delicious bread (February 2015) for a luncheon I was hosting after church one Sunday. I reshot the pictures so you can get a better idea of what this beautiful and marvelous bread tastes like. 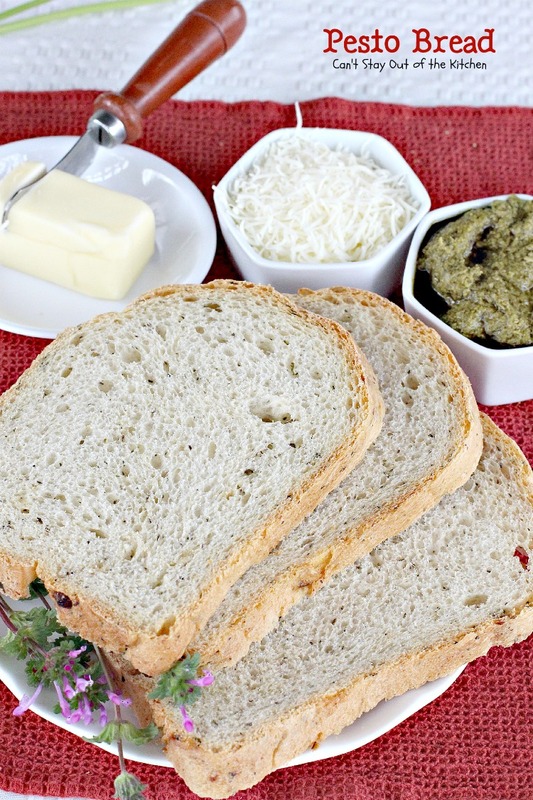 Even though Pesto Bread is great to use as a dipping bread, we enjoy serving it with butter and apple butter, honey, or our favorite jam. This easy bread can be whipped up in about 5 minutes and then baked in your breadmaker. The regular cycle takes about 3 1/2 hours. This hearty bread is great for dinner. We like serving Pesto Bread for company or including it in meals we provide others. Place hot water in the bread canister. 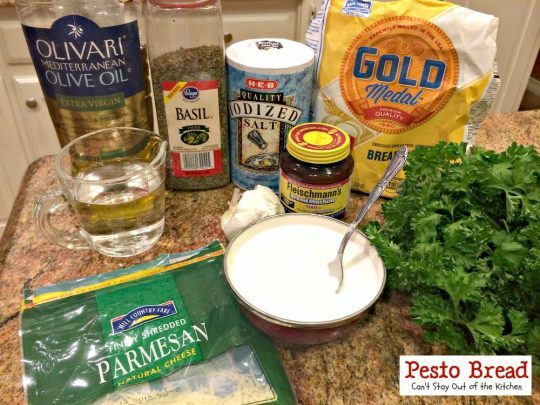 Add olive oil, parsley, parmesan cheese, basil, minced garlic from a jar, salt and sugar. Add bread flour NOT all-purpose flour. Bread flour has more gluten so all the ingredients adhere better and don’t crumble apart so easily after cutting it. Add yeast. Bake on a regular bread cycle. 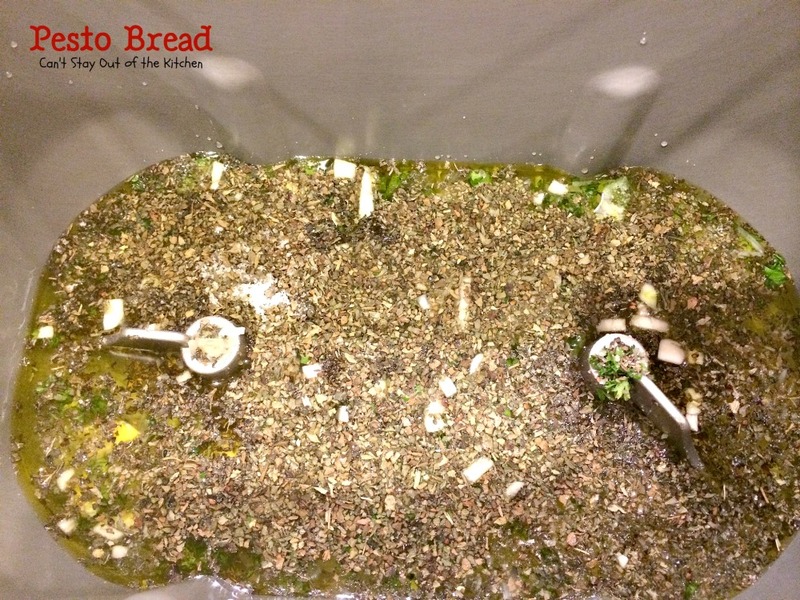 Allow bread to rest in canister 15 minutes before removing from breadmaker. Butter the top and sides of the bread so the crust stays soft and doesn’t get hard and tough. Allow bread to rest an additional 15 minutes before slicing down. Nice thick slabs of homemade bread! Oh, my! 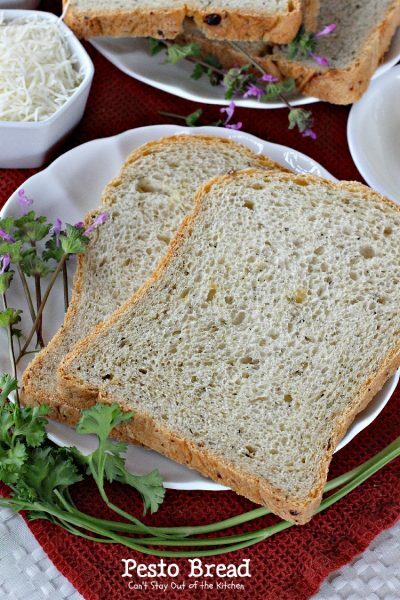 Slice bread with an electric knife. This works much more easily and smoothly than using a serrated knife. Pesto Bread tastes so wonderfully. It’s especially good with fresh herbs and freshly grated parmesan cheese if you have it on hand. 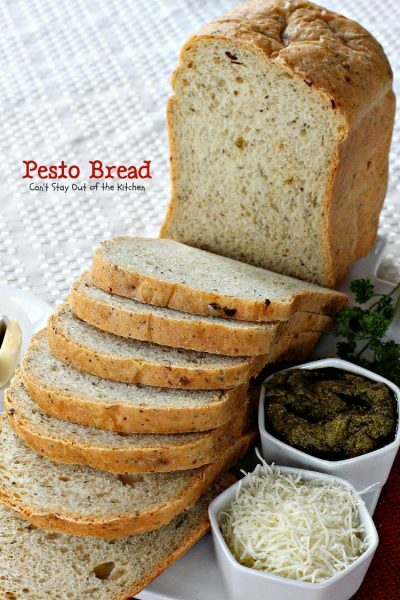 Pesto Bread is an excellent accompaniment to Italian main dishes, stews and chowders, even salads. Wonderful homemade bread for the breadmaker. This one has pesto flavors with parmesan cheese, basil, garlic and parsley. Layer in above order and put on normal bread setting - about 3 1/2 hours. Allow bread to rest about 15 minutes before removing from bread canister. Brush top and sides of bread with butter to prevent the crust from hardening. 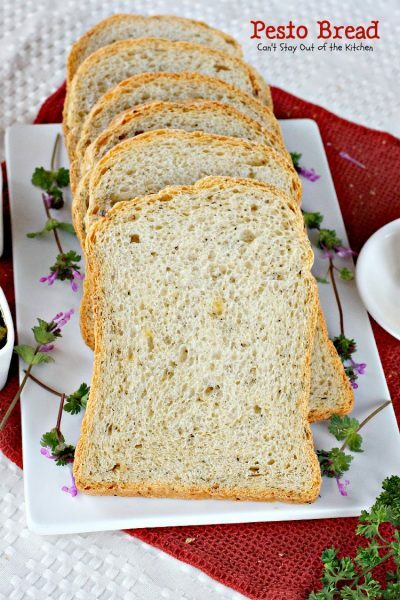 Allow bread to rest an additional 15 minutes before slicing down into slices. Makes about 15 half slices. NOTE: Homemade bread has no preservatives. So after two days, store homemade bread in refrigerator to prevent mold. Recipe adapted from Black and Decker. Layer in above order and put on normal bread setting – about 3 1/2 hours. Homemade bread has no preservatives. So after two days, store homemade bread in refrigerator to prevent mold. Pesto Bread is a fantastic dinner bread to use with dipping oil and herbs or just serve it with butter. Here’s a close up so you can see the texture of this delicious Pesto Bread. You can see the flecks of basil and parsley. Each loaf makes about 15 slices like this. Spread with butter and enjoy. What size of loaf does this make – 1.5 or 2 lb? This makes a 2-lb. loaf, Melanie. I made this bread. It was perfect and everyone enjoyed it. Thanks for sharing. I’m so glad you enjoyed it, Jane. I’ve always loved this bread. I have to make this bread…but my husband doesn’t like cheese. Can I leave it out or sub? Hi, Linda, I’m so glad you’re going to try the bread. The parmesan cheese in a can is not nearly as strong as regular parmesan cheese off the block. That might work. You may also consider trying a vegan or soy-based imitation parmesan cheese. I think the bread will have a great taste regardless. Hope you enjoy it. Oh man, this sounds amazing. I see this in my (hopefully near) future! It is a great bread and so easy.